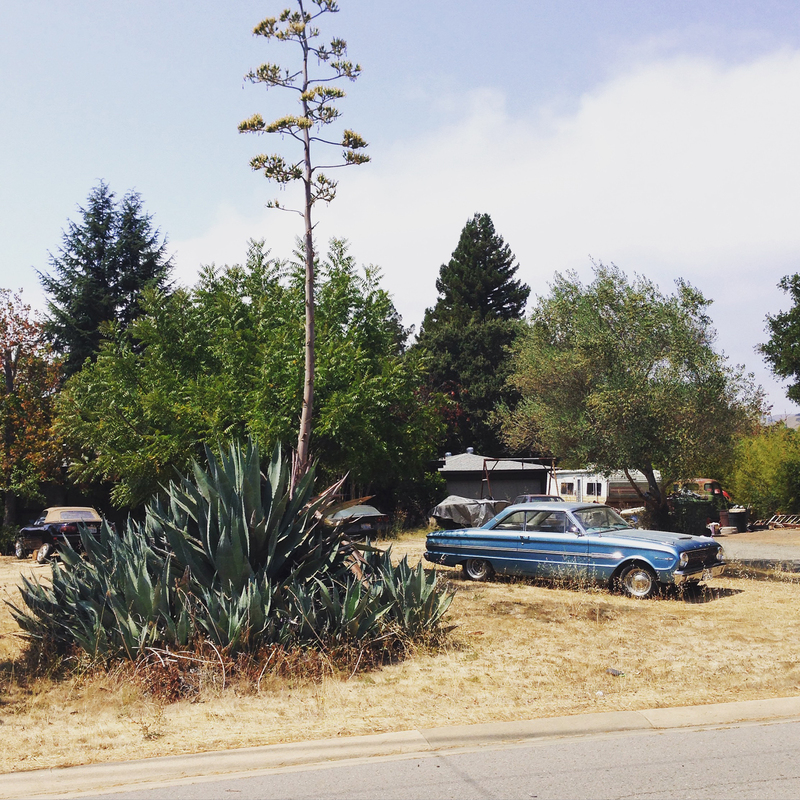 Yes…that is essentially a prehistoric succulent, next to a stunning classic car. Picture a tiny succulent in a pot in your house, and it sprouts some sort of weird floret thingie and you’re like “omg so cute!”. Now picture it 50ft tall…that’s what we’re dealing with here. I grew up in a small (very small) town in rural Manitoba. When I was growing up, I would imagine that many would consider the name of our town to be pretty cute…perhaps even charming. Then the 90s came and everything changed. My town is called Starbuck. Infer what you will about the types of jokes/comments I’ve had to endure for the past 20 years. Currently my fiance Aaron and I are living in a town about 30min north of San Francisco. 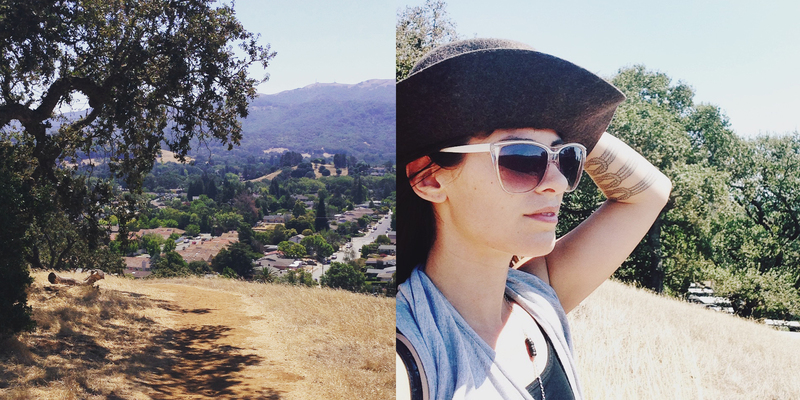 Nine times out of ten we just tell people “just outside of SF” when they ask where we’re living. Because the name of the town is Novato. 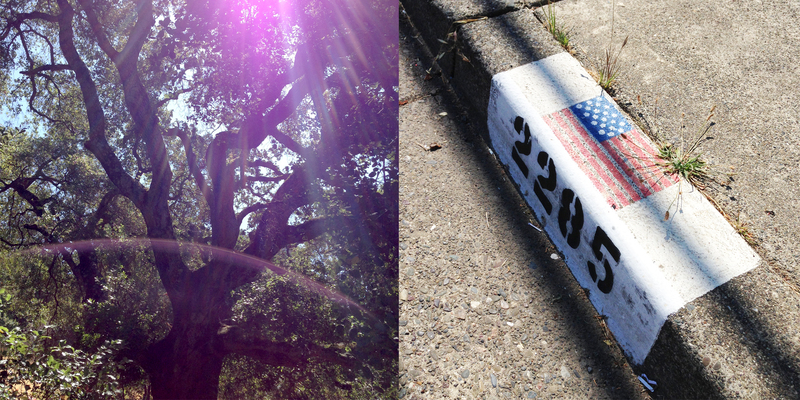 Apparently this is a thing you can do in the US, make a little painting on the curb in front of your house. Some people have sports teams, other people want a constant reminder of what country they’re living in. At 50 000 people I’m not even sure if it’s still considered a town (a city? a suburb? no idea) but what I do know is that it sounds way too close to Nevada when the name is spoken aloud. An awkward name is a cross I’m still willing to bear however, because this town/suburb/human-nesting-zone is a weird city/country hybrid that my 35 year old self is pretty down with. We’ve got horses. We’ve got classic cars. We’ve got lemon/orange trees. Fig trees. Eucalyptus trees…and of course palm trees. We’ve got a cute little old fashioned downtown, but also weird mega-big box store areas. One of which is called “Vintage Oaks”. Gimme a break Vintage Oaks…you’re the least vintage thing around. The top of Miwok Park…refreshingly windy however currently very yellow. In the winter this hill is actually green. ANYWAYS, in order to get out of the house (since my studio is still in Montreal and it’s a long distance situation) and since I have no car here I’ve taken to going on meandering walks a couple times a week. 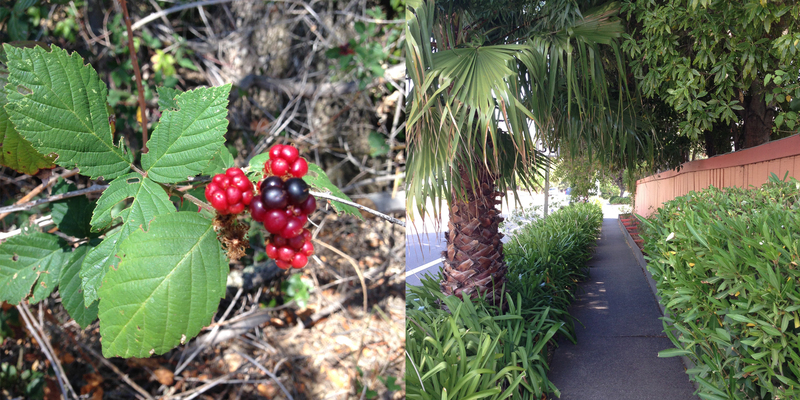 Last week I walked my vintage sandal clad tootsies over to Miwok Park. 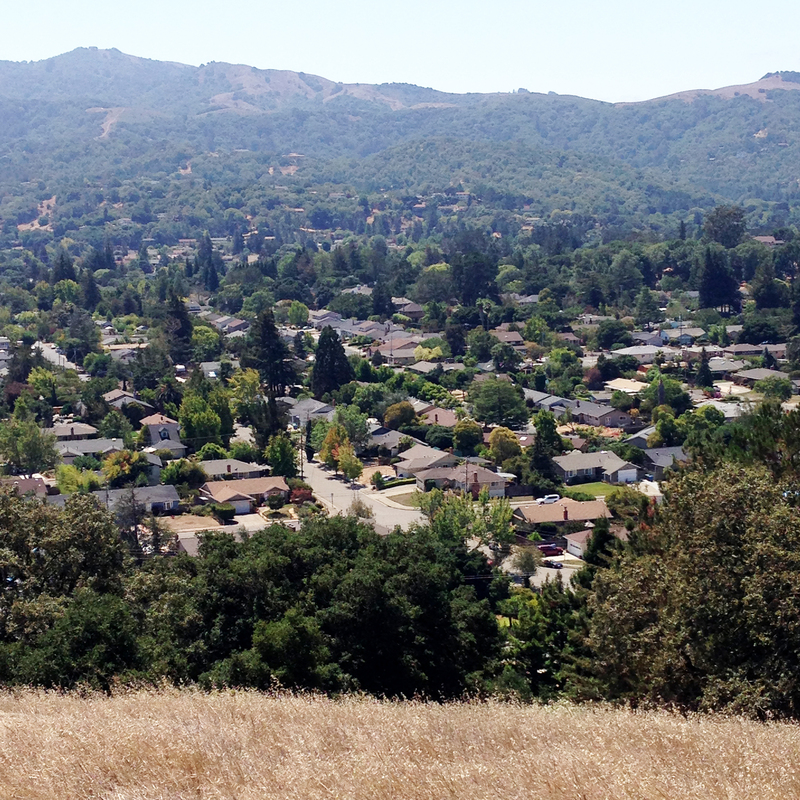 Novato is nestled between a series of hills, making the landscape a small time hikers paradise. 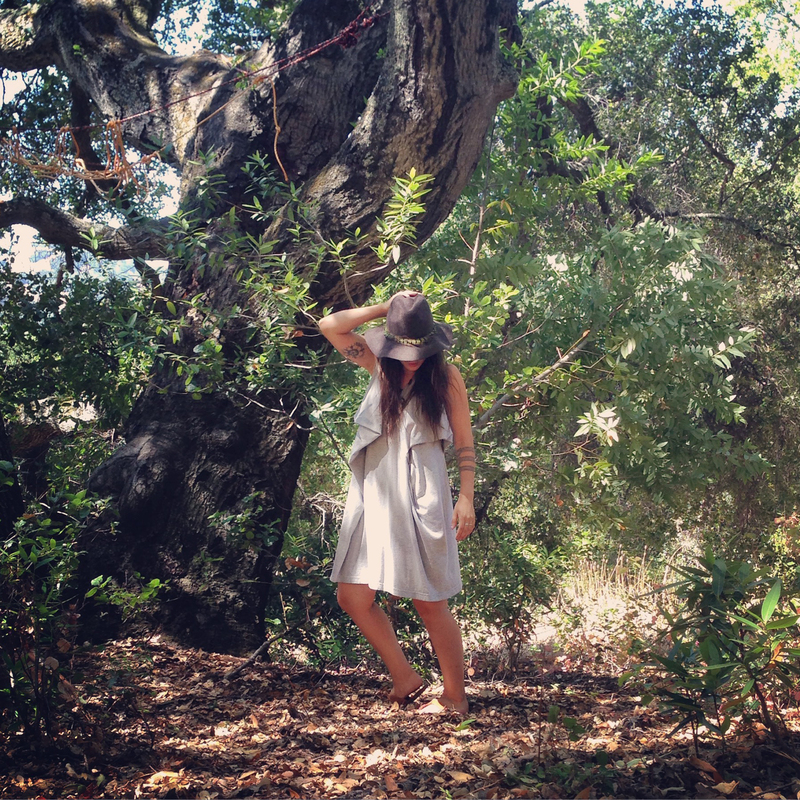 Miwok park is one of those places, and only about 10 minutes from our house. It was on one of these walks up the hill last week that I spontaneously decided to try out the self timer on my phone (side effect of solo walks). This is something I’ve oddly not experimented with much. When I started Norwegian Wood (some of you may remember) I did almost all my product shots on myself, so I think I burned myself out on that whole thing back then. No budget + plenty of time to experiment meant it was the best option while starting my business, but it got boring after awhile. It’s been 8 years since I started NW, so it was sort of fun to get back into that creative mode and start playing around again with self portraiture. Running back and forth and propping my phone up on my purse was stupidly frustrating though, so I’ve since invested in a camera remote and portable tripod. Outfit pics are now inevitable…lord knows I have the exploding closet to support it.